The Allway Retractable Utility Knife features a plastic slide mechanism that never needs lubricating. It has four self-locking positions: Closed, 1/3 open, 2/3 open and a full 1" open. The handle is made out of die cast zinc, and it has a slip-resistant wrinkled finish. 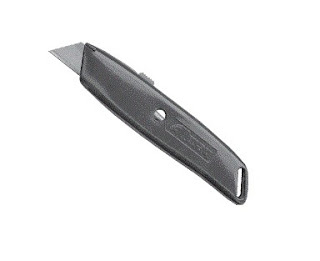 It comes supplied with three Heavy Duty Straight Blades.